This is to inform that baby. 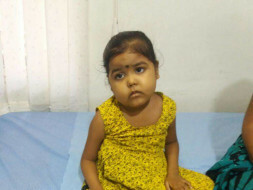 A.Hasini is 4 years 5 months Female D/o Mr. Suresh was admitted at Rainbow Children's Hospital and dianosed to have Acute Lymphoblastic Leukemia.She has been started on Intensive phase Chemotheraphy as per BFM protocol.The treatment part consists of intial intensive phase for 6 months followed by maintenance phase. 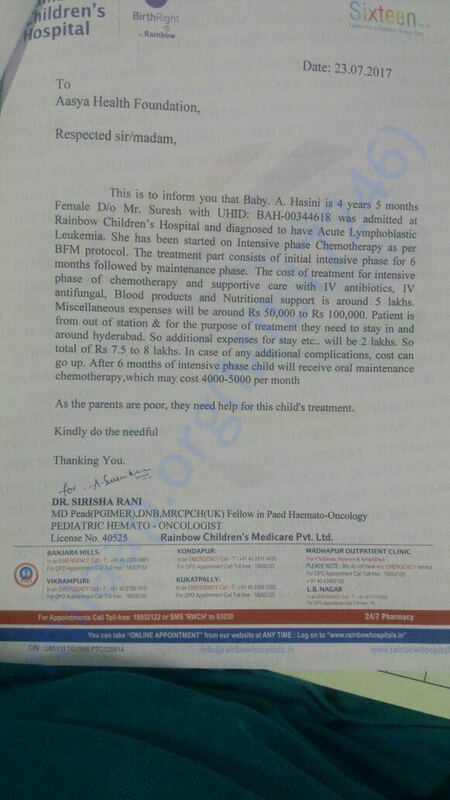 The cost of treatment for intensive phase of chemotherapy and supportive care with IV antibiotics, IV antifungal, Blood products and Nutritional support is around 5 lakhs.Miscellaneous epenses will be around Rs 50,000 to Rs 1,00,000.Patient is from out of station & for the purpose of treatment they need to stay in and around hyderabad.So additional expenses for stay etc.. will be 2 lakhs.So total of 7.5 to 8 lakhs.In case of any additional complications,cost can go up.After 6 months of intensive phase child will receive oral maintenance chemotherapy,which may cost 4000-5000 per month. As the parents are poor,they need help for this child's treatment.